Villa Tramonto takes its name from the sunset over Lake Trasimeno, described as one of Italy’s best, which can be admired from the Villa’s prime location. 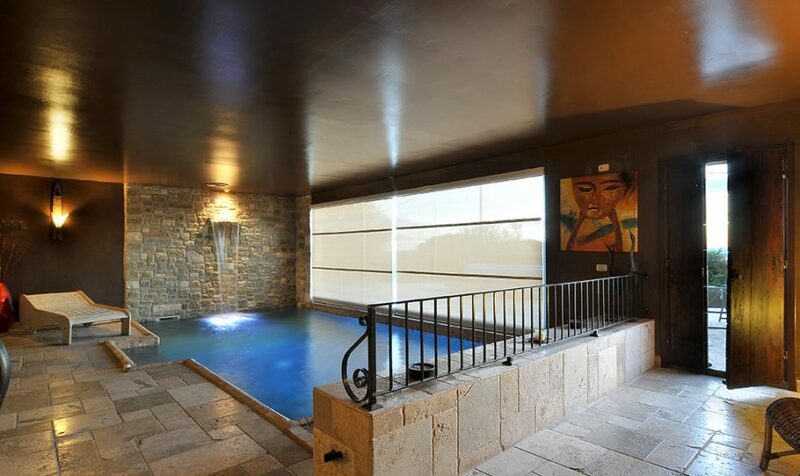 Expertly restored and with a modern edge, this 200 sqm villa is the perfect place where to revive and restore. The villa is laid out on 2 levels. On the ground floor, the spacious living room is joined by the dining room and the fully-equipped kitchen, which opens onto a furnished patio. A laundry room and a bathroom are on this floor too. On the first floor, there are 3 double bedrooms, one with an ensuite bathroom and one bathroom with shower. All bedrooms have terraces opening overlooking a beautiful panorama. Please note that no twin beds are available. The villa is a completely independent complex; with a terraced garden of around 500 sqm, surrounded by a fence and a swimming pool for the exclusive use of the villa guests. Flanked by olive trees, the property is accessed by an electric gate. The swimming pool measures 12m x 5m. Deckchairs, sun loungers and pool towels come with the villa. Villa Tramonto offers other spots for relaxation too: a porch furnished with sofas and a patio outside the kitchen with a table for al-fresco meals. Private swimming pool, free on-site parking, insect screens, air conditioning, Wi-Fi, heating, washing machine, dishwasher, iron and ironing board, microwave, American-style coffee machine, toaster, oven, Moka pot, hairdryer, fireplace, LCD TV, DVD player, panoramic view, barbecue, private garden, patio. Cot & highchair available upon request. The villa is only 600 m from the town of San Feliciano, where there are restaurants, pizzerias, an ice cream parlor, a small supermarket, a newsagent and various shops. The ferry dock to the Polvese island is also here. Guests can walk to San Feliciano but should be advised that the street is uphill. A little further, the town of Magione, where one can find a gas/petrol station, larger supermarkets and banks. Distances by car: Magione 8 km, Passignano sul Trasimeno 14 km, Castiglion Del Lago 23 km, Perugia 26 km, Cortona 35 km, Montepulciano 50 km, Citta della Pieve 32 km, Assisi 47 km, Gubbio 75 km, Florence 141 km, Rome 210 km. By train: Roma 2h30, Florence 1h10, Assisi 1h10, Orvieto 40 min, Arezzo 25 min, Perugia 40 min. A1 Motorway exit: Valdichiana- Bettolle. Airports: Florence 1h30 by car; Rome 2h; Pisa about 2h20. Rate includes: air conditioning, weekly linen change, utilities, wi-fi, pool and garden maintenance, deckchairs and parasols, final cleaning. Extra costs: heating, if guests turn radiators on; a refundable deposit of € 500,00 for incidental damages, to be paid upon arrival.